Ubiquitination is an important PTM in cell biology, as the ubiquitin-proteasome complex has mediated degradation of 80-85 percent proteins, and directly affects the expression level and function of proteins. MtoZ Biolabs is glad to offer ubiquitination identification and quantification service through high-resolution mass spectrometry analysis. 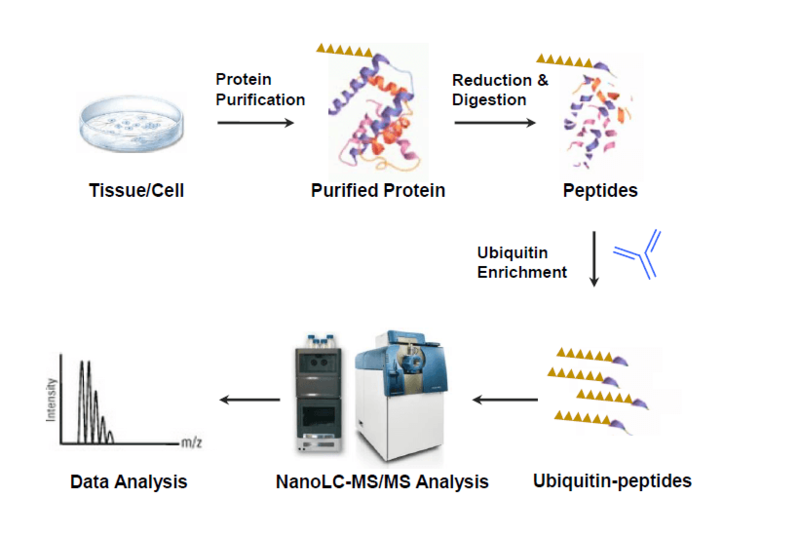 For some low abundance ubiquitin-proteins, we can provide peptide enrichment service before mass spectrometry analysis. To ensure high specificity and efficacy of enrichment of ubiquitin-peptides, we use CST Ubiquitin antibody for enrichment process, and use 2-3 different enzymes for protein digestion to ensure full scan of ubiquitin-peptides. MtoZ Biolabs has developed a specialized platform equipped with Q Exactive HF (Thermo Fisher), Orbitrap Fusion, and Orbitrap Fusion Lumos mass spectrometers, equipped with Nano-LC for ubiquitin-proteomics analysis service. To better solve your research problems, we offer an all-inclusive service, including protein purification, digestion, peptide enrichment and separation, LC-MS/MS analysis, MS data analysis and bioinformatics analysis. All you need to do is to tell us your project objective, and send us your cell/protein samples, and we will complete all the following experiments. *Note: We will perform testing experiments before we start official experiments. To ensure the most cost-effective and accurate analysis is provided, only qualified samples will proceed to the official analysis.